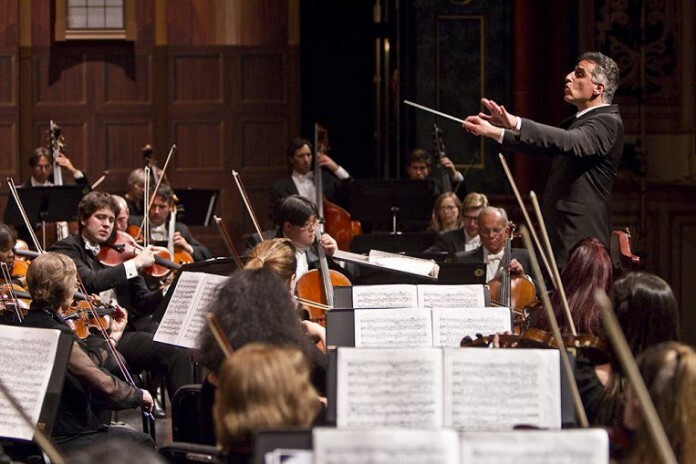 The Santa Barbara Symphony gave concertgoers a taste of the East coast and the Eastern hemisphere on the weekend of Jan. 19, when they resumed their 2012-2013 season with a polished, engaging performance at the Granada Theater in downtown Santa Barbara. The two-hour concert featured violinist Glenn Dichertow and viola player Cynthia Phelps from the New York Philharmonic, who enhanced the diverse selection of pieces for the concert that included a trifecta of musical genres, composers, and time periods. Under conductor Nir Kabaretti, the symphony opened with a modern piece from Japanese composer Toru Takemitsu, and then moved to the more traditional fare of Mozart and Mendelssohn. Kabaretti began the concert by giving a thorough description of the Takemitsu piece, “How Slow the Wind,” which was composed in 1991. This introduction, which included individual orchestra members playing selected passages, gave interesting context to this beautiful but lesser known work of music. The piece itself had a flowing, smooth tone that was fascinating on its own, while serving the additional purpose of working as a backdrop for the primary motif. A seven-note musical phrase was echoed throughout, repeated in different sections of the orchestra and present at both the start and finish of the work. “How Slow the Wind” was also an excellent example of how differing types of sounds can be incorporated into music: much of the piece featured whistling, ringing phrases that seamlessly interacted with more sustained lines, giving the overall feel of constant motion. Despite the differing styles, the transition between “How Slow the Wind” and the next piece, Mozart’s “Sinfonia Concertante for Violin and Viola,” was smooth. This three-movement piece featured soloists Dicterow and Phelps, whose chemistry onstage was amplified by their connection to the orchestra to achieve a strong balance. Rather than compete for the spotlight, they complemented each other onstage. As the piece started, the contrast in style became immediately apparent; like other music from the classical period, this work from Mozart was much more structured, precise, and rhythmically consistent. Throughout all three movements, the primary melodies were split evenly between the viola and violin, which gave their individual lines an interactive, call-and-response feel. The first movement of the piece contained upbeat sections and slower themes, providing an energetic but still controlled atmosphere. As is standard for much of classical music, the second movement had a sedate tempo and minor key, and kept in theme with a more gradual, subdued ending. The final movement to the piece picked up the pace drastically, proceeding at a hurried, exciting speed, and providing an engaging, lively finish to the Sinfonia. After a short intermission, the symphony resumed with a number from the early romantic period, Mendelssohn’s acclaimed “Symphony No. 3 in A Minor.” This piece is often called the “Scottish Symphony,” as it was written during the composer’s time in that country. The four movements shared sweeping and dramatic themes that are characteristic of the Romantic era, unifying them so that they appeared to be one sustained piece of music. The opening movement was defined primarily by lyrical melodies that, while repeated among different voices of the orchestra, were constantly changing from calm to frantic. This was followed by a lively yet dignified second movement that continued the previous section’s trait of passing off melodies between orchestral sections, which reinforced motifs while also highlighting the tonal differences among instruments. While the third movement maintained the ever-present lyrical atmosphere, it transitioned into a slower pace and partially dropped the tension of the work’s other sections in favor of a more elegant, refined mood. The piece concluded with a dramatic finale of changing rhythms, fast, scurrying notes, and soaring phrases in the wind section, leading up to a triumphant ending. The Santa Barbara Symphony’s performance this weekend reinforced their reputation as an accomplished group of professionals. However, this concert went beyond simply talented musicianship with its selection of music. The program featured selections from the classical, romantic, and contemporary eras, which, when combined with a more than capable execution, resulted in a well-rounded and satisfying performance.